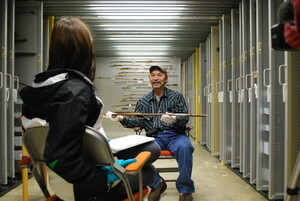 The Inuvialuit Living History project team is pleased to have made our site accessible to the public. Please note that several of the pages on this website are still under construction, and we appreciate your patience. We encourage you to browse the MacFarlane Collection, watch the documentary video "A Case of Access", learn about our Inuvialuit delegation's trip to view the collection in Washington D.C., and view the lesson plans developed for use in Northwest Territory school curriculum and beyond. In advance of the official launch of the project at the end of April 2012, we welcome your feedback, comments, and suggestions for improving the website.